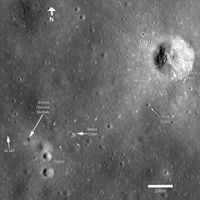 Uncalibrated LROC NAC image of the Apollo 14 landing site and nearby Cone crater. The trail followed by the astronauts can clearly be discerned. Image width is 1.6 km. Apollo 14 Astronauts Alan Shepard and Edgar Mitchell explored the Fra Mauro highlands, which are composed of ejecta from the massive Imbrium impact. During two lunar surface extravehicular activities, Shepard and Mitchell deployed an Apollo Lunar Surface Experiments Package ALSEP, tested the Modular Equipment Transporter (MET; a small wheeled cart used to transport samples and equipment), and collected almost 43 kg of invaluable lunar rock and soil. The ALSEP is visible about 180 meters west of the lunar module, note the well worn footpath connecting the two artifacts. During the second EVA, the astronauts performed what is known as a "radial traverse" across the ejecta field and up to the rim of Cone crater. When impact craters form, rocks excavated from the deepest parts of the crater fall near the rim; surface rocks end up away from the crater. Thus, as explorers move up a crater's ejecta blanket, they can sample a complete stratigraphic section of geologic materials providing priceless insights about the composition and nature of the lunar subsurface. Think of an impact crater as a natural roadcut exposing rocks from depth. 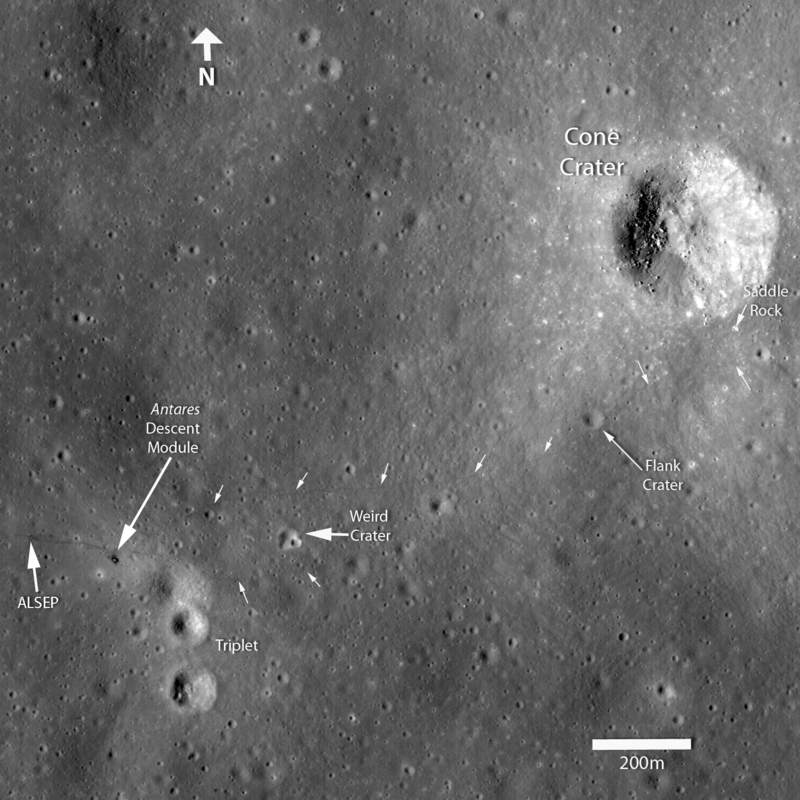 In this LROC image, you can follow nearly the whole path walked by the two astronauts. The term "radial traverse" does not quite do the crew of Apollo 14 justice. Their journey sounds like a stroll in the park, however the reality is quite the contrary. The hike up Cone crater was quite challenging. For the first time, astronauts traveled out of the sight of their lunar module while hiking uphill over 1400 meters with only a poor map, dragging the tool cart (MET), and wearing their bulky spacesuits. It was an amazing feat that the two astronauts made it to the top of Cone ridge and acquired all their samples. They ended up about 30 meters shy of peering into Cone crater itself, surely a disappointment at the time, but absolutely no reflection on the success of the traverse and the scientific results gleaned after the mission. Figure 1 above highlights the locations of some of the landmarks explored by the astronauts. As correctly deduced during postflight analysis by the Apollo science teams, it is evident from the astronaut tracks and features seen in surface pictures matched to the LROC image, that the astronauts just barely missed (30 meters) the rim of Cone crater. Saddle Rock, a large boulder visited by the astronauts at Station C1 (below), can be discerned in the LROC image.